HPANWO: Help Me, Ben Goldacre! I’ve had a little accident, as you can see. Yesterday I tripped over one of our cats, Jessie, on the stairs. I fell headfirst down ten steps and sprained my right wrist and ankle. (I’m typing this clumsily with my left hand!). I’ve been to the hospital and have had physiotherapy where they taught me some excersises and put my arm in a sling. I thought of asking Ben Goldacre personally for a bit of Western, White Man’s Big Pharma Medicine! (See: http://hpanwo.blogspot.com/2009/03/bad-science-by-ben-goldacre_25.html) Actually I’m going to see somebody tomorrow who’s going to give me a bit of acupuncture and so-called "Quackery" like that. I’m not angry with Jessie; she was just doing her cat-like thing by stopping in front of me on the staircase. It’s my own fault for not putting up a second banister which I said I would when we moved into this house. 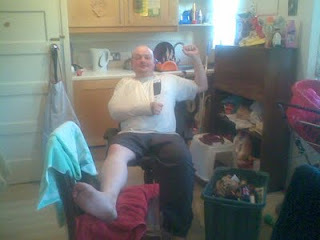 I’ll be better soon and ready to fight for Hospital Porters’ Pride and Dignity and against the New World Order! WOW Ben! I have 4 cats myself, I'd better be careful!! Be well soon my friend! Thanks, Alex. I'm much better now. I'm coing home from my health treatment tomorrow. Thanks, Jacob. Indeed there are not many Stephen King stories I'd want to be in! I'd either be in jail or beinmg chased by monsters! My favourite is "The Mist" (See my review of the film), but I'd not want to be in that situation. I'll probably be back at work by the end of the week. Give my love to my other Brother and Sister Porters. Don't turn your back on the little blighters!